If you plan to use the Internet to rent, buy or sell, you have to be aware of some of the dangers. You need to make sure that you use common sense, do good research on potential buyers and have a good line of communication. Dealing locally, where you can see the other party face-to-face, is always best. There are a few things to look out for as shown below. You can also check out some Sample Scam Emails. Inability or refusal to meet face-to-face before consumating transaction - Seller might ask only for the shipping fee. This looks like a great deal, but most times you'll send the fee and never see the animal or item. Use Common Sense - If a potential buyer seems too good to be true, isn't worried about shipping costs or the price of an animal or item, that can be a warning sign. Don't fall in love with a buyer just because they are willing to pay top dollar. Offering more than the asking price is also a common scam tactic. Watch for International Buyers - Buyers wanting to purchase items or animals from international locations (not locally) are usually not actually interested in the item. Shipping anything is expensive. Watch for International Sellers - Sellers wanting to send you their item or animal from international locations (not locally) are usually not going to send the item. Shipping anything is expensive. They will notify you that the item has shipped (even though you didn't purchase it). Sometimes their price will be very, very low, so you can't refuse. You'll then be asked to pay their shipping company (a fraud) with your good money. They never ship the item or animal, and you are out the money. Study the information in the ad - Be suspicious if there is a trailer ad listed in the horse or tack section. Or, if there is an email address in the description of the ad, or on a picture. Also check the city and make sure that it is actually in the state shown for the listing (and check the zip code to see if it matches the state/locale). Another tip-off to a scam could be the picture in the ad. If it is in Phoenix but shows trees/vegetation from the eastern US, be suspicious. Lastly, if the price is very low, and its too good to be true, it probably is!! Verification Code Scam - Be aware of receiving an email or text message from a person asking you to receive a code via text message and then give them the code. 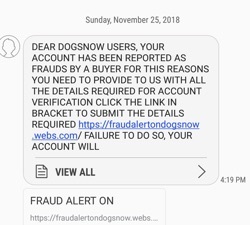 Our system requires verification of a phone number to place an ad, and this person is using your phone to get the code and verify their fake account so they can place a scam ad. Please don't provide them with the code. The Western Union Money Transfer service is a great way to send money to people you know and trust. If you need to send money to someone you don't know well, you may be putting yourself at risk for fraud. Never send money to a stranger using a money transfer service. Beware of deals or opportunities that seem too good to be true. Don't use money transfer services to pay for things like online auction purchases. Never send money to pay for taxes or fees on foreign lottery winnings. Never send a money transfer, in the name of a friend or relative, with the intention of changing the name to someone you have not met personally. Never send a money transfer, in the name of a friend or relative, in order to delay payment of the transaction to someone you have not met personally. If you think you've been a victim of fraud, please contact us by filling out a ticket in our Support area. In this scam the seller tells the buyer to send the money via Western Union, the seller then asks for the Western Union MTCN # or the money transfer number (this is basically a number that gives the scammer access to the money). Once the scammer has the MTCN or money transfer number, he/she can pick up the money at any Western Union worldwide and disappear. The buyer has paid, but the item that was paid for will never be sent. Generic First Contact E-mail - Many scammers will send out lots of e-mails to various sellers trying to find one that might be a potential target. When they do this, they often write a form e-mail that could apply to any ad. An example might say something like: "I saw your [item] for sale online and am very interested. Please contact me." Communication that could apply to anything for sale during the first contact can be a tipoff to a scam. 809 Area Code - There have been phone scams related to this area code. Be cautious if you are contacted by someone and asked to call a number with an 809 area code. You can read more here or Google that topic for more information. Cashiers Check Payments - Buyers not willing to pay in cash may be scamming you with fraudulent cashiers checks or money orders. If you receive a check/money order that looks real, remember that computers can print almost anything these days. Pressure Tactics - If a buyer seems in a rush or wants to speed up a transaction / shipping, be careful. They may just be interested in scamming you before you realize that the transaction is fraudulent. Financial Information - You should never give out your financial information. Asking for bank account info in order to wire funds or other personal information is a sign of a scam. First contact via phone - You are much better off with a buyer if they contact you via phone on the first contact. Online and e-mail solicitations are easy to do, but phone calls are not an efficient means of communication for scammers. For U.S. complaints use the Federal Trade Commission Consumer Complaint Form. For Canadian Complaints contact the Royal Canadian Mounted Police.